Nobody is too young for reading! Read aloud, night or day to your baby. Your voice is soothing and it encourages bonding. I read the newspaper to my little boy! 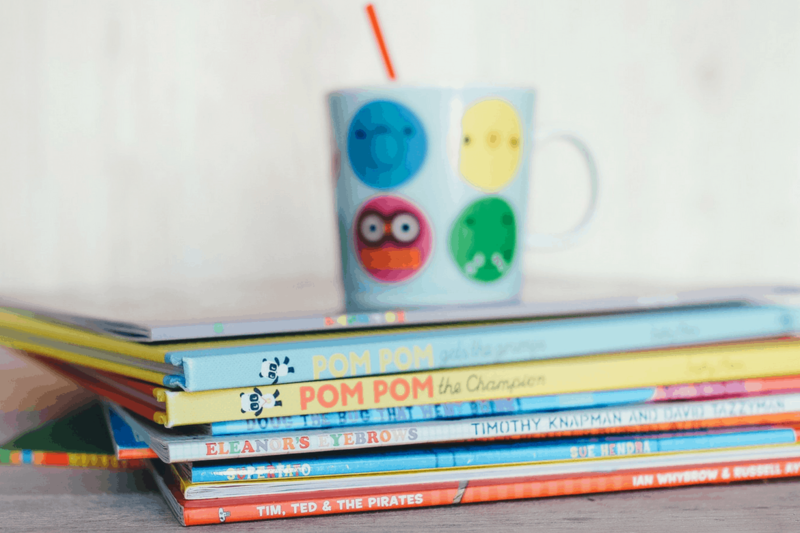 Buy picture books and board books. They are colourful and can be chewed! Encourage your little one to look, point and touch. Choose books with repetitive text to build language skills and find some that are crinkly and shiny. For older babies pick books with rhyme and simple language that introduce the concept of shapes, colours and numbers. We love the touchy feel books from Usborne! Move forwards from picture books to story books. Get your silly voice on; you don’t have to be good. ‘…Fi-fi-fo-fum!…’ put some FUN in your voice! Ask questions. ‘What does a cat say?’ Listening to a story does not have to be a quiet affair. With toddlers don’t worry if they get bored two pages into a book. Don’t force them to sit still but do try and get in the habit of reading once a day. Pick a couple of favourites. Read the same book often and the child will predict what will be happening. Little ones may pretend to read, encourage it, nod and smile even if it is total toddler waffle! Go to library groups. Encourage your little one to hold a book the right way up, turn pages and learn that text is read from left to right. Also encourage them to follow your reading with their little finger or put their finger on yours. Talk about the cover of the book and about what might be happening in the pictures. Talk to your child about putting a breath space between words. Buy an alphabet book. Pronounce letters phonetically and learn the hilarious actions, i.e. ‘buh’ rather than ‘bee’, as this is the way they will learn them at school. Be prepared to play ‘I spy’ for 100 hours. When your child starts reading solo, read early in the day before they are too over tired. Keep the reading sessions short. PRAISE them, make positive associations with reading! Be patient. If F becomes F for Fart…roll with it. Do your children have a favourite book they like to read? We love touchy feely books like the “that’s not my…” series- also books with mirrors (takes after me…). I love reading to the baby and agree they are never too young for stories! I love getting book suggestions, we read to baby bump every night but since she arrived we haven’t had time. Think it’s time to build it back into the routine again. I’ll look out for the osboutne books, touch and feel would be great when she’s tiny! Haha, reading uni books to a baby is a good was of multi tasking!